I wonder how many American College of Cardiology (ACC) members are aware that the ACC entered into a "Memorandum of Understanding" with the American Board of Internal Medicine (ABIM), (along side the American College of Physicians and American Society of Clinical Oncology) "to explore development of collaborative pathways through which physicians can maintain board certification:"
What is not mentioned is the exchange of funds that will occur between organizations. How much will ABIM's inter-organization "certification" cost? 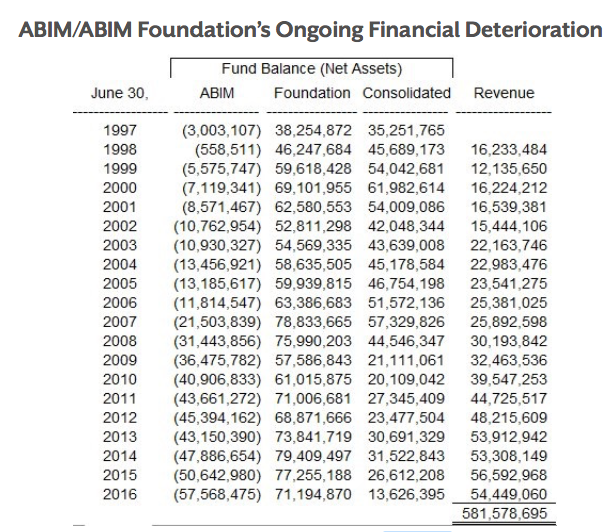 Might this be one more financial bail-out strategy for the ABIM, given their long history of financial impropriety and rapidly depleting consolidated net assets? Why does the ACC insist on perpetuating MOC when the AMA House of Delegates voted to end the program? Might these organizations' own financial and political aspirations supercede the needs of their members? How much more money will practicing cardiologists have to spend to remain employed at their hospital systems now that MOC is increasingly tied to our credentials and insurance payments? MOC has become one of the largest single causes of burnout and distrust in our professional societies that increasingly ignore their members' concerns in the name of political correctness and personal gain. This professional society collaboration is anything but helpful to resolving the MOC impass and only serves to strengthen our resolve to end it. "... diplomats would be asked, but not required, to renew the validity of the certificates at periodic intervals or face the uncertain consequences of loss of their status as certified internists, subspecialists or holders of certificates of added qualifications." 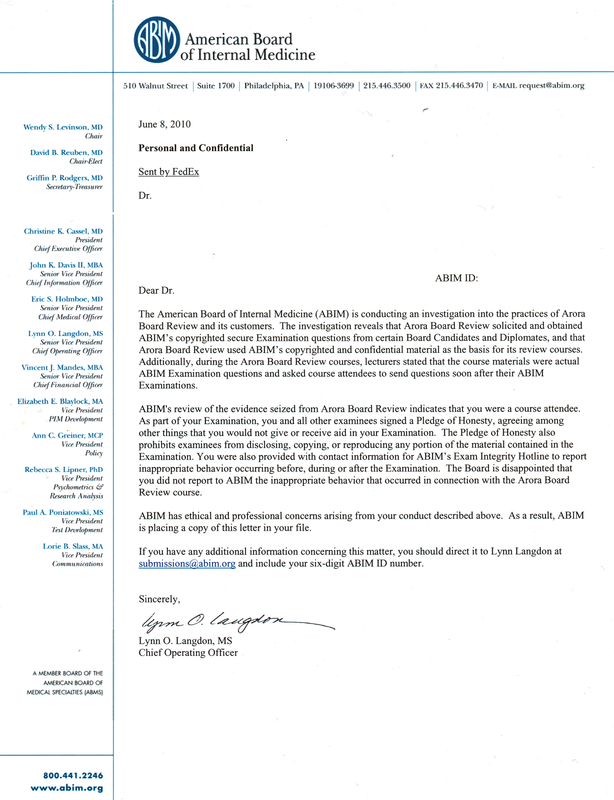 "Candidates for Board Certification and Maintenance of Certification agree that their professional qualifications, including their moral and ethical standing in the medical profession and their competence in clinical skills, will be evaluated by ABIM, and ABIM's good faith judgment concerning such matters will be final. ABIM also may evaluate candidates' or diplomates' fitness for Board Certification – including their professionalism, ethics and integrity – in disciplinary matters, and ABIM's good faith judgment concerning such matters will be final." (ABIM Online Maintenance of Certification Policies. Available at http://www.abim.org/maintenance-of-certification/enrollment-cost/policies.aspx . Accessed 3 Sep 2017). "ABIM's review of evidence seized from the Arora Board Review reveals you were a course attendee. As part of your Examination, you and all other examinees signed a Pledge of Honesty, agreeing among other things that you would not give or receive aid in your examination. The Pledge of Honesty also prohibits Examinees from disclosing, copying, or reproducing any portion of the material contained in the Examination. You were also provided with contact information for ABIM's Exam Integrity Hotline to report inappropriate behavior that occurred with the Arora Board Review course. ABIM has ethical and professional concerns from arising from your conduct described above. As a result, ABIM is placing a copy of this letter in your file." "The American Board of Internal Medicine is moving against nearly 140 doctors who it says cheated on the organization's certification exams by seeking out, sharing and in some cases purchasing actual test questions from a board-review company. Board certification isn't required to practice medicine, but is commonly needed for doctors of all stripes to secure hospital privileges or participate in insurance plans. In suits filed Friday in U.S. District Court for the Eastern District of Pennsylvania, the ABIM alleges that five physicians infringed the organization's copyright on test questions. The suits also accuse them of misappropriating trade secrets and breach of contract." "I must say, candidly, that with over 50 years of law practice I have never before seen the likes of the repeated attempts by Dr. Westby G. Fisher to malign a person based upon an 11-year old “blip” in his long and successful career of public trust. It is, to be sure, unconscionable, to be using invective to shame the ABIM and, along the way, destroying the career and good name of a very honest, competent person, I know that if a member physician were similarly treated you would be mounting the ramparts to obviate its harm to his/her career." How much money does the trademarked time-limited ABMS MOC® program generate annually for the ABMS and its member boards? Fear and intimidation might sell MOC® for a while, but when the US medical education and credentialing system in the United States relies on fear for little more than its bloated bureaucratic and political purposes, it is non-sustainable. Practicing physicians like myself will not be ruled by fear-based policies and politics, especially when those imposing the mandate are completely unaccountable to our patients and our families. I would encourage all of my readers to boycott the ABMS MOC® program (irrespective of the "kinder and gentler" model MOC® pivots toward), remain board-certified with the National Board of Physicians and Surgeons, and to consider joining Practicing Physicians of America, to protect our civil liberties of free speech and Fourth Amendment protections against illegal search and seizure. Our ability to care for patients without such intimidation demands nothing less.